Please refer to our stock # 1059 when inquiring. 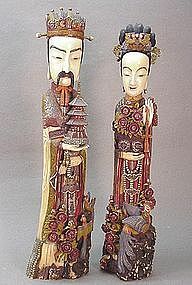 The pair of mid 19th century carved ivory emperor and empress are 14”~15” high, 3”~3 ½” wide and 2 ½” thick. The emperor’s right hand holds a pagoda; his left hand carries a long sword. Two small long tailed birds and a flower plant are placed in front of him. The empress’s right hand holds a flower basket; her left hand carries a tassel. A large phoenix sitting on a garden rock is beside her. The impression on their faces are very well presented and their robes, hat, hair pieces, jewelry are all nicely carved and colored. Aside some worn pigments due to age, they are in really great shape.